We all know the widely used “traditional” Customer Satisfaction Score (CSAT), for which a respondent has to express his/her satisfaction for a certain topic on a score from 1-5. In 2003 the Net Promoter ScoreSM(NPS) was introduced. 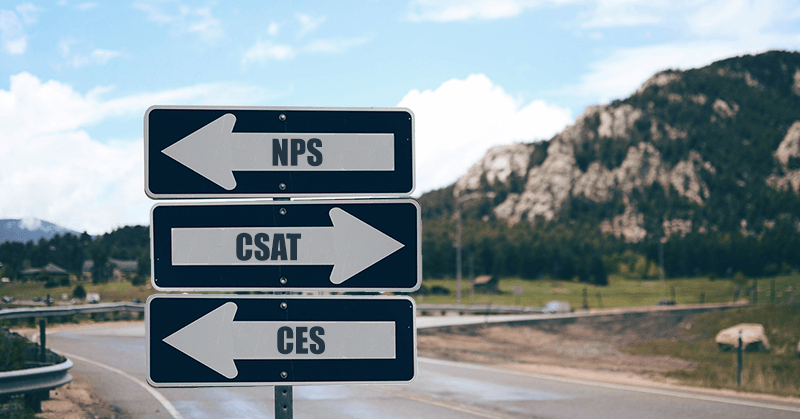 Whereas CSAT is a useful score to measure short-term happiness of your clients, NPS focuses on measuring long-term happiness, on customer loyalty. Compared to CSAT, NPS is claimed to be a better predictor of customer behavior and strongly correlated with measures of company growth. The NPS score has even been further developed by CheckMarket as an automated feedback program [see our article ‘The 4 stages of Net Promoter Score (NPS)’]. A different measure was introduced in 2010: the Customer Effort Score (CES), developed by CEB. The Customer Effort Score takes a different angle compared with the previous measurement tools: the customer is asked how much effort he put into a certain interaction with the company. Research by CEB, the creators of the Customer Effort Score, showed that “Service organizations create loyal customers primarily by reducing customer effort – i.e. helping them solve their problems quickly and easily – not by delighting them in service interactions”. There are currently 2 versions available of the CES. The first version of CES – “How much effort did you personally have to put forth to handle your request?” on a 5-point scale from very low effort (1) to very high effort (5) – has caused some complications as the scale is inverted (1 is good and 5 is bad) and the word ‘effort’ wasn’t easy to translate into all languages. The latest version of the question (v2.0) is a disagreement/agreement rating question “The organization made it easy for me to handle my issue”. This question solves the scale issue and avoids using the word “effort”. We prefer to keep the scales in the same order (from negative to positive), so it avoids confusion among the respondents. So looking at it this way, CES 2.0 is a welcome new version of CES! Question How would you rate your experience with your … (e.g. recent support requirement)? The organization made it easy for me to handle my issue On a scale of 0-10 how likely would it be for you to recommend [company name] to a friend or colleague? The essential thought behind this score “Service organizations create loyal customers primarily by reducing customer effort – i.e. helping them solve their problems quickly and easily – not by delighting them in service interactions.” Customers are more likely to share negative experiences than positive ones. By monitoring your detractors and getting them back on board of passives or promoters, you can enhance your NPS score. Method of measurement CSAT score is the sum of respondents that answered somewhat or very satisfied. Obviously, the higher the number the higher your customer satisfaction will be. After aggregating the replies, a high average indicates that your company is making things easy for your customers. By comparing the different customer satisfaction measurements, we can conclude that each has its own applicability, and limitations. These measurements could stand on their own as a measurement tool for certain occasions, but can also complement each other. For example, we could imagine a survey to measure the satisfaction among attendees of a recent event you organized. When building a feedback survey you could ask the respondent to fill out some Customer Satisfaction scores (CSAT) split up into different areas of the event ( satisfaction about content, timing, speakers quality, location, etc.). Additionally you could ask the CES question to measure the efforts your customers needed to sign up for this event. In the end of the survey you could ask how likely your customers are to recommend your company based on this event experience. When comparing the NPS and CES score in particular, research shows that these scores correlate with each other: customers that indicate they had to make little efforts to fix a problem, also tend to give a high NPS. However, it is still worth using both measurements in one survey. Whereas NPS gives you a picture of your customer satisfaction on an overall level, your CES specifically indicates how you perform in handling customer issues. What you need to keep in mind is that no single measurement can properly address all of your company elements that influence customer satisfaction. You can combine these customer satisfaction measurements and find out through experimentation, what mix of measurements is the most effective for your company. The high flexibility of the CheckMarket survey tool – which includes NPS as a pre-programmed question and customer satisfaction survey templates with CSAT, CES and NPS- allows you to easily blend these questions into an optimized survey that serves your company best. In the end what truly matters is that the results of these scores are transformed into actionable points for your company to work on. All three measurement scores can help you with this, but they should always be considered as a means to an end, the end being a higher customer satisfaction. What do you think? Are you using the three measures in the same survey? What are your experiences? Let us know here in the comments. Want to start measuring NPS, CSAT or CES? Try our tool for free. Effectively measuring customer satisfaction? Ask the right questions! I agree with Sven-Tore that NPS has never been validated by academic-quality research, but it’s head and shoulders above the research behind CES. That research is flawed on multiple levels: 1) They don’t measure actual loyalty as the outcome variable, only intended future loyalty. 2) The questionnaire design and execution is weak. Notice they rewrote that awful first version of the core question — but still want us to believe the research findings from a question they say is invalid! 3) Statistics is not their strong suit. They interpret statistics incorrectly. This blog post was really helpful! Especially the chart comparing the 3. I have some objections to the some part so the article. The CSAT question is not just intended for single points of interactions but is just as much a question to use to gauge the overall satisfaction with a company. So the limitation you stated for CSAT is not really true. In terms of the scale used for CSAT the ACSI (American customer satisfaction index), that can be seen as sort of the benchmark of CSAT surveys, is not 1-5 but 1-10 and each of the points don’t have labels, just the end points 1 and 10. One can use 1-5, but a 1-5 scale is not recommended as you lose information in the “neutral zone” of grad 3 and 1-5 don’t give you room for detecting nuances. 1- 10 also have better properties for statistical analysis. In the table. “The essential thought behind this score” is left blank? This seems very strange, like if you are implying that there is no thought behind it or that you can´t imagine what it is. I guess “To measure the level of customer satisfaction” would be the idea behind the score of customer satisfaction. The CSAT score is usually presented by a mean value or transformed into an index value (as the ACSI) rather than looking at the percentage answering the top two boxes as you have indicated under “Method of measurement”. One again you can look at the ACSI for reference. But presenting is as the % in the top two boxes is also quite common but just as a net score you lose information when you don’t include the full scale (mean value captures the full scale and all respondents). Loyalty is the result you are after but when measuring loyalty bu asking customers questions (not measuring behaviour) it has been shown in several scientific robust scientific studies that overall satisfaction is actually better a predicting loyalty behaviour and financial growth than a question of recommendations. Some references to some of the scientific studies can be found here: http://blog.verint.com/net-promoter-score-nps-criticisms-and-best-practices. The article in the link is a good read to get some insight into the many shortcomings to NPS. To this date there is not a sigle scientific (peer reviewed) study supporting that NPS predicts growth. The study that was used to launch NPS in HBR is also flawed (and HBR is not a peer reviewed magazine). In many cases the act of recommending is not likely to drive new business or just not relevant at all to ask. The NPS is also not suitable for measuring the experience a customer have with a single touchpoint or a single transaction in relationship covering multiple transactions (that’s advice straight from Satmetrics)as NPS is constructed to measure the relationship as a whole. To answer Tiina Mobergs question, you can yes CES in the same survey as CSAT and NPS. No problem, but try and use the same scale so you don´t confuse the respondents. It’s all about helping customers solve their problems quickly and easily – which highly correlates with high customer satisfaction. It’s all about easiness. Do you have any other experience with CES? And what about combining them with CSAT and NPS: Can it be done?